China, Glassware, Stemware, Tumblers, Flatware, Lighting, Napkins & more. Take-Out Containers, Packaging, Placemats, Tablecovers, Napkins, Drinkware & more. Blenders, Mixers, Juicers, Glass Washers, Bar Accessories, Mixes, Party Kits & more. Chairs, Stools, Tables, Booths, High Chairs, Coat Racks, Outdoor Furniture & more. Cookware, Utensils, Storage Containers, Cutlery, Apparel, Specialty Tools & more. Cleaning Chemicals, Soaps, Trash Cans & Recycling Bins, Restroom Supplies & more. Chafers, Buffetware, Serving & Display Trays, Beverage Service, Carriers & more. Singer designs and builds over a thousand commercial kitchens and foodservice operations every year, throughout the country and internationally. With decades of industry experience, our design team focuses on efficiency, flexibility and cost effectiveness. We work collaboratively with you to deliver a streamlined, productive operation that’s comfortable for your staff as well as your patrons. From multi-unit chains to independent restaurants, educational facilities to healthcare, our market-specific teams understand your needs and provide innovative solutions. 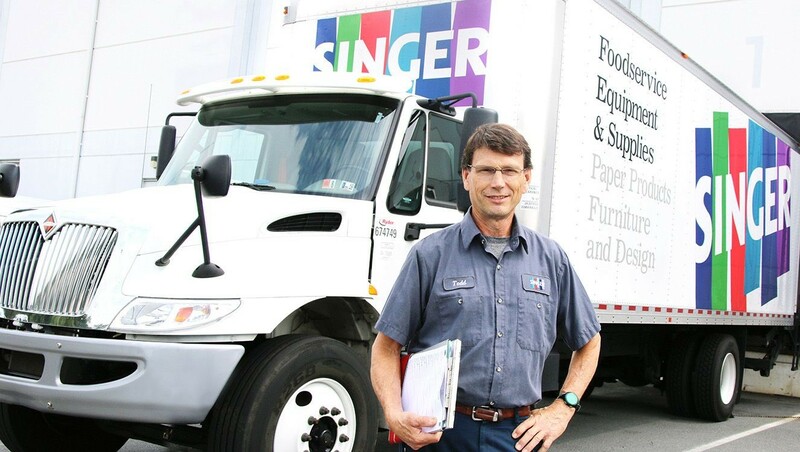 Over the course of 100 years, Singer has differentiated itself from other food service equipment and supply dealers with exemplary service delivered by almost 500 employees to more than 5,000 customers annually. Instilled in Singer’s culture is a passion to care for our customers – to serve you as a reliable and trusted partner in supplying you with the products and services you need to run your business. To bring you ideas that help make you more efficient and successful. To solve your problems. To always be there for you – Responsive, Knowledgeable and Friendly. "...it is amazing that work done as promised stands out in today’s world of excuses, disappointments and re-active planning. It’s always a pleasure to work with professionals. You should be proud that your expansion has not diluted your core values of the business and the Singer name!"